Make any kind of post about anything that is "Yellow." Since this Tuesday, September 1st, is the first day of school, the first thing that popped into my head is a big yellow school bus. Cory will be getting on one in the morning and starting his last year of high school. Somehow my baby grew up, and now he's a SENIOR. Real simple when you think about it, huh? I'm from the US, so when I read about flats in Manchester, I think about shoes. I'm thinking probably there's a lot of walking in Manchester, and it's best to wear flats instead of heels. Of course, that's not what they mean at all. In Manchester, a flat is a place to live, what we would call an apartment here. Sometimes I wonder why we even claim to speak English when we have such different words for the same things. Sure, we can understand one another, mostly, butsometimes it's like we're speaking a completely different language. Of course, now that I bring it up, I can't actually think of any. So I'll leave that up to you - how many things can you think of that we use different words for here in the US than they use in the UK? Oh, and if you want to see a really cool website (or you're looking to rent a flat in Leeds), click the link. I had a lot of fun playing with the spinning cube. Some of those flats look really nice, too - and this time I'm not talking about shoes. Cory took these pictures of Tillie and said I should use them for Camera Critters. Tillie was out on the deck begging to come in. Instead of letter her in, Cory grabbed the camera and took pictures of her. Poor cat. She’s so abused. Do You Know a Fantasy Football Fanatic? I'm starting to see some discussion about Fantasy Football on my facebook feeds, mostly from my guy friends. Still, it does seem a little stereotypical to think that Fantasy Football is something that only guys would be interested in. For instance, I was talking to a friend yesterday whose sister is into all kinds of sports, whereas he isn't a huge sports fan - but she wants him to help her pick her Fantasy Football team this weekend. From what I know about Fantasy Football, it seems like you need to know all about the players and the teams and stats and probably a bunch of other stuff I don't even know about. It can get pretty complicated, even for huge football fans. At least that's the impression I get. You'd think she'd ask someone who closely follows football to help her. Still, it's good brother/sister time, right? I'm thinking that I'll send my friend a link to WaiverWire so he can use the tools and resources there and come out looking like a really smart big brother. It's worth a try anyway. The basic package on WaiverWire is FREE and includes all kinds of information - player rankings, cheat sheets, NFL headlines, picks of the week, and more. WaiverWire is a brand new site created by a group of fromer Wall Street guys who love football. They applied all the tools they used to use to analyze stocks and built this site using those same tools and techniques to analyze football players and Fantasy Football teams. They say that WaiverWire.com has everything you need to win your fantasy league in one place. Of course, if everyone is using it, I'm not sure how that works. Everyone can't win, but I guess it just makes things more interesting. So if you know a Fantasy Football Fanatic, have him or her check out WaiverWire. If the basic package doesn't give her enough information, there are also some upgraded packages with even more tools, both at drastically reduced prices for the 2009 season. That get back into a regular schedule in preparation for back to school thing didn't last very long. Jeffrey and I got up on time and walked Monday and Tuesday. I got Cory up when we got back on Monday, but then Tuesday I let him sleep a little later - because he went out with girls to Culver's the night before and didn't get home until late. Then Wednesday, Jeffrey and I didn't get up, and it's all his shoes' fault - they gave him a blister. And also he wasn't coming home that night so some extra snuggle time was definitely called for. Then, since he didn't come home last night (he was in Chicago for work) I didn't go to bed until way past my bed time. This morning I didn't get up until after 6:30 - only to discover that it was raining so I couldn't go walking, so I made coffee. And didn't get Cory up until 8:00. One more day this week. I wonder how that will go? I recently received one of the new Flameless Luminaries from the Febreeze Home Collection. It's a battery-operated wooden base that comes with changeable scented shades. When you set the shade onto the base, it lights up and flickers just like a candle. The slight heat from the light activates the scent in the shade, too. Each scent has a different design, so they not only smell good, they're pretty, too. I received one base and two green tea citrus shades. We had to try it right away to see how it worked. It really does look like you've got a candle burning, but with no flame so you don't have to worry about forgetting it. And if you do forget about it, it will automatically turn off after 4 hours. Unfortunately, as with all most scented things, the smell was a little strong for me. I liked the scent, but I just couldn't handle it for long. I had Cory take the shade off the base and turn it off within about a minute. Even after that the smell was pretty strong with it sitting on the dining room table with the breeze blowing over it. I eventually had to put it back into the box in an attempt to contain the smell. The good news is that, if you really need to freshen up a room or cover up a bad odor, this little thing should be able to handle it - and look good doing it. I know that's what it's supposed to do, but I really would like the option for a lighter scent maybe, one that's not so powerful. There are some other scents that might be a little better for me because they're more fruity. The Cranberry Pear and the Pomegranate Mango scents sound really good. There are also some seasonal scents coming that sound great - Caramel Crisp and Orchard Cider. I'm supposed to be getting one of those to try, so I'm looking forward to that. Unscented shades would be nice, too - so we could enjoy the soft glow of the luminary when we don't want a fragrance. I got tired of stains making it through the laundry, only to be noticed when I was folding the clothes and too late for me to do anything about them. So I bought some Shout Gel and put one in the bathroom by the clothes hamper. There's also another one downstairs on the washing machine. Everyone in the house knows we have them and where they are. If they get stains on their clothes, they are supposed to treat them. That way I don't have to remember to treat the stain - providing they told me about it in the first place - and I don't have to look over every article of laundry as I'm sorting it, just in case someone spilled something. Overall this works pretty well. The Shout can be applied even a week before the item is washed without hurting it, and it's always best to treat stains right away. I still have a few stains that make it through the laundry, but not as many. If I notice a stain before I throw something into the washer, I sometimes treat it again, and I try to check it after the wash and before I throw it into the dryer. If the stain hasn't come out completely, I'll treat it again and throw the garment in with the next load - if I remember to check, that is. Too many times I just pull everything out of the washer, throw it in the dryer, and go. I think I have a solution for that, though. Last week at the fair, we got a couple of those write on/wipe off magnetic lists boards (what do you call those?) - so I put one downstairs on the dryer. The idea is that, when I want to check something to see if the stain came out before throwing it in the dryer, I'll write it on this list. Then, as long as I remember to check the list, I should remember to check the stain! Remember the days when you actually had to get up and change the channel on the television? Well, not any more. Now you just point your handy remote control in the general direction of the television, and change channels to your heart's content, without moving off the couch. Unless, of course, you need a different remote - the one for the stereo or the DVD player or the VCR. Then, unless you planned ahead and had all those remotes within arm's reach, you have to get up, find the right remote, and then figure out how to make it do what you want it to do. Sound familiar? We have a lot of remotes in our house. I'll be the first to admit that I don't always know which remote I want for what thing, and when I do get my hands on the right remote, I don't always know which button to push. Luckily for me I have teenagers in the house, and they usually seem to be able to figure it out. For people who don't have teenagers to figure out how to use all the remotes, or just for people who want to simplify things and get all those remotes off the coffee table, there's the new Yamaha neoHD. It's a really nifty system that allows you to control everything with one very simple remote. When I say everything, I mean everything - TV, DVD player, BluRay, iPod, gaming system, Internet radio, and more. The remote is very basic and easy to use, allowing the user to make selections via the clean and simple on-screen interface. Basically, decide what you want to do - Watch, Play, Listen - and then choose your desired source. You don't have to figure out what channel the TV has to be on so you can watch a movie on the DVD player or what to set the stereo on so you can see the picture and hear the movie, too. Complete control with one remote! It sounds great. I really love the idea. What I don't love right now is the price tag - because I'm cheap. Unfortunately I missed the chance to enter to win one, because I wasn't paying attention. I do plan to find NeoHD on facebook so I can keep track of what's happening in the world of Yamaha NeoHD from now on. What do you think? How badly could you use one of these? School starts next week, so we're attempting to get back on schedule - in preparation. We've been kind of lazy all summer, not getting up at regular time and snoozing for a while instead. It is kind of nice to snuggle up instead of jumping out of bed. What that means, though is we've been getting up about the time we should be coming back from our walk. Jeffrey gets straight into the shower, and I get dressed and go fix his lunch. Then I've been walking after he leaves for work. I've been getting my walking in, but he hasn't. Last summer we did a good job of getting up at normal time and walking, but somehow got off to a bad start this summer. It had something to do with work and with building the deck. Jeffrey may not have been walking, but he was getting some exercise building that deck. But summer is about over, so today we got up at 'normal' time - when the alarm went off - and went for our walk. I didn't actually get Cory up before we left like I do during school, but I did get him up when we got back. He needs to get adjusted to getting up early again, instead of sleeping in until all hours of the morning or afternoon. That means he also has to adjust his schedule and stop staying up until all hours of the morning talking to his friends online. Of course, a lot of them are going back to school, too, so they're gonna need to get their sleep, too. Going back to school is a big adjustment for teenagers. When our kids were born, we didn't send out birth announcements. We called people, we made an announcement at church, and we went on with our lives, adjusting to having a new baby in the house. Looking back, I'm not even sure how we would have gone about putting birth announcements together if we had wanted to. Nowadays it's so easy, and kind of fun, too. Photo Affections has a new online preview tool that makes it really easy. There are over 140 designs you can choose from, and then you can upload photos, edit text, and see how your announcements will look right away. I started creating one for Beth - yes, I know it's about 19 years too late, but just for fun, to see what a birth announcement would have looked like. The design I liked says it's for a baby boy, but that's just too bad. It was really easy to put the text in - her name, birth date, weight, length, parents' names, but then I needed to upload some photos. 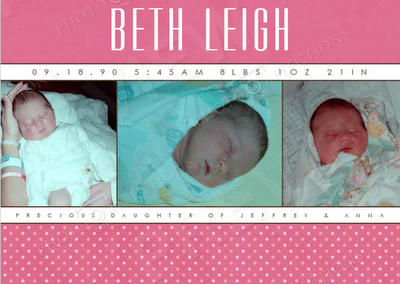 The only problem is that I don't have any digital photos of Beth as a baby. So I uploaded some random pictures from my computer (of Tillie!) to see how easy it was, and it was very easy. Just upload, drag the photo to the announcement where you want it, and you can even do some minor edits. Once you have everything the way you want it, you see a preview of the way your announcement will look. It is just a preview, and a designer will review it, tweak it, and get an official proof back to you in a couple days, but it's really nice to see it right away. It makes me wonder if maybe we should have created birth announcements when the kids were born. It wouldn't have been nearly as easy, though. Wasn't she just adorable? Like I said, about 19 years late for a birth announcement, but it was fun to put together anyway. Where'd They Get That Bling? Have you ever looked at Rap and Hip Hop stars and wondered where they get all that bling? Seriously, it's not like you can find it at the jewelry counter of your neighborhood Kmart. Well, I just found out. Part of the reason I love paid posts is that I find out all kinds of interesting things! There's a website called HipHopBling.com where you can get all kinds of Hip Hop Jewelry. They've got jewelry from $10 all the way up to the really expensive stuff - diamonds. Belt buckles, bracelets, chains, over 150 styles of Grillz - if you've got a little hip hop wannabe in your house, this is the site for bling. Many of the popular bling trends have even started here. I'm a little curious about some of this stuff, so I think I'm going to browse around for a while. Win a laptop at Petroville - I always wanted a Trapper Keeper, but a brand new computer would be better. Win a laptop at Busy Mom - this thin, lightweight computer with a long-lasting battery would be so useful. Win a laptop at Want Not - a PC that a Mac user is on the whole pleased with, and I think that's saying something! I've been entering all of these, and now I will cross my fingers and cross my toes and hope I win! How Do You Feel About the End of Summer? I got an email yesterday that mentioned this end of summer poll for moms. It caught my attention because one of the questions asks how you feel about the kids going back to school - will you miss them or are you excitedly dancing a jig and celebrating the arrival of that yellow bus? As good moms we should all miss the kids terribly when they go back to school, right? Maybe not - because currently 66% of the moms who have voted say they are more than ready for those kids to go back to school. In all honesty, these polls leave a lot to be desired. Yes, they're fun, but oftentimes our feelings fall somewhere in the middle. Yes, I'll miss my handsome son when he goes back to school (September 1st), but I'm also glad it's about time for school to start again. And I know I feel differently about it now that he's 17 than I did when the kids were little. Back then I was sometimes ready for them to go back to school about a week after school let out for the summer, or about the time the "I'm bored. There's nothing to do." whining started. We also had a lot of fun over the summer going to the beach, roller blading, watching movies, etc. Where's the in-between choice? The one that says I have mixed feelings, and it all depends on the day, the time of day, and whether or not he helped around the house when I asked him to, or some other such thing. The same goes for some of the other questions - School shopping: 'have to cut back this year' or 'Yay! another reason to shop'? For me, personally I am never looking for another reason to shop, but I'm also not feeling like I have to cut back this year. I need a 'same as always' choice. There are also questions about summer food, summer clothes, and summer weather, and I have mixed feelings about all of them. Maybe this just says something about me? Create great experiences for others to increase what you earn. The more quality content you share and the more interaction you have with others, the more points you'll earn. Maximize your earnings by creating consistent, popular experiences and conversations for the rest of the community and by promoting them to people who share your interests outside of Gather. So, share more content on Gather and earn more points. Points can be cashed in for gift cards from places like Amazon.com, Starbucks, Target, The Gap, and Home Depot, and can even be paid in cash through PayPal. I think I've been missing out by letting my Gather account sit unused! How about you? Do you have a Gather account? Have you been using it and earning lots of Gather Points? Feel free to run on over to vote and join the discussion on Gather and/or leave your comments here about how you feel about the end of summer. How in the world can it be over already? is a legitimate answer here. Contrary to what Rosie said in that last post, we aren't quite joined at the fingers and keyboard. I do spend quite a bit of time on my computer - paying bills, blogging, looking up and posting recipes, doing research, keeping in touch with friends and family, even playing lexulous. Recently, though, I've been trying to get away from the computer, hoping to get more stuff done around the house - maybe even get caught up. The problem is that, not only am I not getting any blogging done, well not as much as I'd like, I don't think I'm getting any more done around the house than before. Basically, I just feel like I'm falling behind everywhere. And when I find time to read other blogs, I see moms who are busy, busy, busy and still find time to blog about all the things they're doing, and post reviews, and host giveaways. How do you girls do that? I just can't figure it out. Hi, I'm Anna's best friend. We're practically like conjoined twins - joined at the fingers and keyboard, we're so close. I've been a big part of her life for 3 years now. I've helped her design web pages and that 'award winning' school calendar she did all those years. Did I get credit for that? No, it was all her and Mary, but let me tell you - she could not have done it without me. She tells me everything. Sure, she posts a lot of it on her blogs so the rest of you can read it, too, but just remember - she tells me first. And couldn't post it without ME! What do you call a blogger without a computer? Lost, completely lost. She'd be lost without me. Like I said, we're best friends. That's why I'm not worried, even though she's been looking at this HP dv6z Artist Edition 2. Sure it's pretty, and I'm getting a little worn, but it is not my fault the letters are wearing off my keyboard. The N is practically gone! I choose to believe that we have a deeper relationship than that, and that Anna won't be swayed by a pretty face case. I can edit photos and videos and help her stay connected to her family and (other) friends just like this pretty computer. Also, I'm pretty sure she's planning to keep me around for a while, since she just bought me a new battery, and my service plan doesn't expire until next summer. Her husband has been looking for a new computer. Maybe she was looking for him. Yeah, that's it. I've got nothing to worry about. Right? Get $500 off instantly when you purchase an HP HDX 16t with $300 coupon code NBN3248 + $200 Instant Rebate. Valid through 8/23 or while supplies last. Restrictions and exclusions apply. Shh, don't tell Rosie, but this laptop's really nice looking, too. $500 savings! Perhaps you can use them to get a best friend of your own. I made a special trip to the grocery store last week to buy Kellogg's products. They were on sale, I had coupons, and even better, there's a Fuel for School $10 rebate on 10 products. I bought cereal, the Keebler cookies that Jeffrey likes so much, crackers, and the new Cinnabon bars that Deb reviewed a couple weeks ago - they looked so good, I just had to try them. With the sale and the coupons, I got all 10 items for around $15. Combine that with the $10 rebate, and that's goes down to $5 or around 50¢ per box or package. Then I got home and read the rebate form more carefully. The Cinnabon bars and the Special K crackers weren't listed. I immediately emailed Kellogg's to clarify whether or not these products qualified for the rebate, and tried to figure out if I could go back to the store, grab a couple boxes of PopTarts or something and have them re-ring everything, if I had to - because all the products must be listed on the same receipt. Luckily, I don't have to do that because I got an email from Kellogg's last night letting me know that even though those products aren't listed on the rebate form, they still qualify because they are Kellogg's products. There are so many Kellogg's products, I guess it would be impossible to list them all, wouldn't it? Thank you for getting back to me, Kellogg's. Now I can cut out UPCs and get my rebate ready to mail without worrying. There's still time to get your own Kellogg's Fuel for School rebate. Buy your Kellogg's, Keebler, Sunshine, Morningstar Farms, and Eggo products by 9/30/09, send in the rebate form (get it here, lower right hand side), UPCs, and cash register receipt by 9/30, and get $10, plus a $70 coupon code from Dell, good toward select Dell Inspiron Mini and Studio laptops. We just got our home owners insurance renewal, and it lists everything that's covered. There's a certain amount of coverage for the actual house, and then there's another amount for the contents of the home. I'm not sure how that's figured. I mean, how do you figure out how much everything in your house is worth? For that matter, if something happens to your house, how do you even remember everything that you have? I've been thinking that I need to go through every room in our house and take pictures of everything we have - televisions, DVD players, computers, furniture, etc. Then if I upload all those pictures somewhere, we'll always have a record of the stuff we have. That would come in really handy if we ever have to make a claim on our home contents insurance. Another option could be to take a video, with narration, to document everything. What about you? Do you have home contents insurance? What have you done to record everything you have? Or, if something happens to your home, will you be sitting down and trying to make a list from memory? I really should get busy with those pictures, huh? I've been sitting here trying to come up with a blog post and so far nothing. Why is it that while I'm busy doing other stuff I have all kinds of ideas running through my head, but then when I actually sit down at the computer, I can't remember any of them? Or, even worse, I sort of remember the idea, but I can't remember all the great wording and sentences, and paragraphs that flowed so effortlessly while I was vacuuming the floor or tossing laundry into the dryer. Nope, I sit down, and it's all gone. Tonight, even the ideas are gone. So, instead, I'm playing lexulous. We went to the State Fair last Sunday. When we’re at the fair, we really enjoy the horse pulls. The horses are gorgeous, and it’s so much fun to watch them. Usually we watch the heavyweight division on the last day of the fair, but this year we got to see some of the lightweight and middleweight divisions, too. We missed the youth competition in the Clydesdale Show, which we got to see last year, because Cory didn’t work until the afternoon and the competition started at 8am, but we really enjoyed the horse pulls. Weren’t they gorgeous? And HUGE? It looks like Kmart is starting a tradition - Kmart Bluelight specials on Saturdays. Of course, there's no way to know how long this tradition will last, so if you want to take advantage of some great sales, you'll want to check out Kmart this Saturday, 8/15. Kids Backpacks (Athletech, Route 66 and Licensed) reg. $19.99 – Bluelight $8! That's less than half price. We were sitting on our new deck eating dinner tonight trying to figure out what other patio furniture we could possibly use, because 70% off and then an extra 20% off of that if you catch the Blue Light, is like practically getting that patio furniture for free. If you've been putting off getting your patio furniture, that sale is for you. If you're like us and already bought your patio furniture, don't worry because there will be over 40 specials throughout the day. There's bound to be something you could use. Something in electronics, maybe? Along with all those in-store specials, there will also be some great deals available on Kmart.com - this Saturday only. There's only one problem with all these great deals - I don't usually do any shopping on Saturday. So what I'm hoping, Kmart, is that you have some of these Bluelight Specials on a different day of the week, too. Maybe bring back the Bluelight specials for good? Just because I'm missing out on the deals doesn't mean you have to, so be sure to get to Kmart and snag some good deals. Also, be sure to follow Kmart on Twitter for all the latest deals and news. Will Kmart bring back the Bluelight specials for good? Will it become a Saturday tradition? We just don't know. What we do know is that this Saturday there will be plenty of specials, and that Bluelight will be flashing again. There are several blogs hosting giveaways for a sweet Acer Aspire Timeline laptop. For best chances, I say visit and enter them all! Win a laptop at Deb on the Rocks - her nocturnal kids sound like Cory, and I agree with youngest son - everything should be online! Win a laptop at Bacon is My Enemy - of course Paige should not have to watch movies at her desk, of course! Win a laptop at Owlhaven - amazing battery power on this thing! OK, enough entries for now. I am going to eat chocolate cake. I'll enter and list the rest later. I just entered the laptop giveaway at Mocha Momma. Back to school rituals? Hmmm… I don’t have any clear memories. I’m sure we bought some clothes and whatever school supplies we needed, and I’m sure my mom looked for the best deals possible. That’s pretty much the same as our back to school rituals now – buy everything on sale, whether we need it or not. Last week I bought two packages of pencils, only to come home from the store and find out we already had about 20 million pencils. Still, they were really cheap. Yesterday I bought free pens. I have a whole stash of school supplies, because when the folder are on sale for 10 cents, I buy lots! The same goes for notebooks – and now my kids want the expensive 5 subject notebooks instead of wanting to use those cheap 1 subject ones. Oh, and this is my sons last year of high school, and next year, for college – this laptop is what he’s going to need! Thought I'd share my comment for the fun of it. Run on over and leave your own if you want to win a brand new shiny Acer Aspire laptop. I just entered the Sears Campus Ready and UPromise sweepstakes - twice for me and twice for Jeffrey, since it's limited to 2 entries per person per day. If we have any friends or family out there who would be willing to enter twice per day, too that would be great. I just browsed through the Sears CampusReady site, and I can definitely say that we are not Campus Ready. Not at all. Remember when you had your first baby, and you could hardly believe how much stuff one little person could need? Clothes, a crib, a stroller, a car seat, a high chair, and the list went on and on. Well, I'm starting to wonder the same thing about sending a kid to college. Who knew he'd need so much stuff? Stuff for sleeping, eating, getting ready, cleaning, organizing, studying, shared living, and this list seems to go on and on, too. Luckily we have this last year of high school to get it figured out, right? The CampusReady section of Sears.com looks like it's going to be really helpful. I especially like the interactive shopping list. You can choose all those categories, like sleeping, eating, or cleaning, and select the items in each category that your student will need. You can either shop right online at Sears.com or print out the checklist for shopping in store. How handy is that? There are some dorm room design ideas to choose from, so if one of those designs fits your student's personality, Sears has made it easy to find the items needed for that particular room design. There are some girly ones, one for an athlete, and it looks like one for a gamer. I don't see anything that I think fits Cory, but he can design his own by using the CampusReady on Facebook dorm room designer. There's also a roommate matchup and a gift getter app, which looks like a way for students to list all the things they'll need for college and then hopefully get friends and family to pay for some of them. I'm all for that, because even at the best prices possible, all this stuff is going to add up, and fast! Speaking of costs, we all know that the cost of sending a kid to college is not getting any cheaper. Besides giving financial tips for the students, Sears is also offering parents a chance to win money toward their child’s college tuition from Sears and Upromise! A total of $25,000 will be awarded, a $10,000 grand prize and 3 $5,000 first prizes. Upromise members are automatically entered with a sears.com purchase through Upromise.com, or you can enter for free at sears.com/campusready. I am definitely entering this one! You can enter twice per day from now until 8/31/09. I just finished registering Cory for school - his last year of high school. He's a SENIOR this year! How in the world did that happen? Where'd my little boy go? Since I only had one student to register this year, my registration costs decreased significantly. Last year it was over $300, this year only $170. This year, for the first time, they actually sent out a cost sheet ahead of time so we the parents could have an idea how much the registration costs were going to be. Finally! I've been wishing for something like this for years. I always hated having to go into school registration with no real clue how much it was going to cost me. Not that it would make a big difference, it costs what it costs, but it's still nice to have an idea. As I was writing my check, I mentioned to the secretary who was adding everything up that I really appreciated having that. Even if it is the last year for us. Now I wonder if they could get me a list of all the other costs that are going to come up throughout the school year? This is not another post complaining about the air conditioning - mainly because we haven't had to use the air conditioner much this summer. Yes, it's been wonderful! We did turn it on before we left for the fair yesterday, because it was supposed to be hot and humid, and we had to shut the house up because it was probably going to rain. We figured it would be nice to come home to a cool house after running around in the heat all day. Well, the rain came through and it got cold (or cool anyway) and then Beth came home and opened all the windows - without turning the air off because she 'didn't know the air conditioning was on' - so we turned the air off and left the windows open. No, this is a post about laundry. I recently ordered some wool dryer balls from a seller on Etsy. I'd read about them on a blog somewhere and really wanted to try them. Basically, "Felted dryer balls eliminate the need for static cling dryer sheets and PVC dryer balls. They help reduce drying time, minimize static on laundry, and can be used over and over again." I've been using the plastic dryer balls you can buy at Walgreens or Walmart for a while now - trying to get away from dryer sheets. I've never been completely happy with the way the dryer balls control static, and I thought the wool ones would do a better job. So I ordered 4 of them, and I really liked them. They really do seem to control the static a lot better than the plastic balls. And then one of them started unraveling. I was finding wool yarn pieces throughout my laundry. I contacted the seller, and she was very nice and sent me a replacement ball. The day I got that one and started using it, another one started unraveling. I followed the instructions the seller gave me to hopefully re-activate the felting process, which seems to be getting the wool to shrink up and the fibers to bind together, but it did not work. I'm kind of frustrated because I had high hopes for these wool dryer balls, and now 4 out of the 5 dryer balls I have are unraveling. I'm back to using the plastic ones. Apparently this is not supposed to happen. My dryer must be exceptionally hard on dryer balls, or something. I'm thinking that if I can find some wool socks or maybe an old wool sweater at Goodwill I could stuff the balls into the socks or the sleeves and sew them shut. Then I could use my dryer balls without worrying about them falling apart. Because I want to use them. You crafty people feel free to jump in with suggestions for how I can salvage these balls. Yes, the seller has offered to send replacements, but I'm thinking I need a Plan B. If you'd like to participate in the Give Me Five Monday meme, post your list, visit BeccA's Buzz, and sign in. We'll be heading to the Wisconsin State Fair tomorrow. Cory has to work from 3:30-10:30 so we'll just take him to work, drop him off, and spend the time he's working hanging out at the fair. If he had his license I suppose he could drive himself to work, and we could stay home, but we always enjoy running around the fair. We like looking at the animals, so maybe I'll have some new critters to share for Camera Critters next weekend. We also always have to look at all the gadgets and gizmos and infomercial type products for sale, usually taste some wine, pick up as many free samples as we can, and listen to some music along the way. Oh, and then there's the food. I will not be trying the new chocolate covered bacon, and I would not be trying that even if I did eat pork, but I'm sure we'll find something good to eat. I especially like the food in the Wisconsin Products Pavilion, because I love seeing the foods that are grown and produced in Wisconsin. The Golden Guernsey booth where Cory is working is in there too, so of course we'll have to stop by and say 'Hi' to him a couple times. While we're walking around the big expo center I'll debate whether or not to sign up to win some Branson vacations, a kitchen makeover, or a new car when I see the entry forms. I usually decide not to sign up because I know I'll never win, and all I'm doing is giving them my information so they can call me and try to get me to attend some timeshare presentation or something I do not want to do. Sometimes the prize is good enough I just have to try - after all, it's the State Fair and anything can happen, right? I'll be sure to let you know if I win anything. Mostly I figure it's a day to spend hanging out with my husband, and that's good whether I win anything or not. I heard about this on the news last November and posted it because I knew it would come in handy. Cory will be taking the ACT next month, and I'm expecting him to spend as much time as possible on this site between now and then. I'm also posting this again for anyone else who has a student who needs to study for the ACT or SAT. She’s just so cute, my camera just points at her automatically! I love watching birds soar and small planes fly. It must be absolutely amazing to fly! For now the best I can do is find some swing sets and swing as high as I can go, right up to the clouds. Maybe someday, flying lessons… but for now I just take pictures of the planes that fly over. The Wisconsin State Fair started today, and that means Cory is working for the next couple weeks. This is his 3rd year working the Golden Guernsey booth at the fair, and he really enjoys it. The days are long, and there's a lot of standing, but it's a pretty easy job selling milk and greeting people. This year he even has the gel inserts for his shoes the first day! Last year he suffered through day one and then he and his dad stopped at Walgreens before his shift the second day to buy some inserts. Those things really do make a difference! Too bad they can't have some GelPro mats for everyone to stand on. He's working again tomorrow and then Sunday. I took him and dropped him off this morning because he didn't have to work until 11:30, but on most days he has to be there at 8 or 8:30am, so his dad will swing by there and drop him off before heading to work, and then pick him up again after work. There may be some waiting around either before or after work, but he'll figure out something to do. Beth mentioned tonight that she really wants a cream puff, but she's probably not going to make it to the fair. I told her to ask her brother, nicely, and give him some money, and he can go get one for her between the time he gets off work and the time his dad picks him up. It won't take long, but it will give him something to do at least one day. Anyway, it's a busy schedule for a couple weeks, but pretty decent money for a young man. I'm not sure what he's got planned for his money this year, probably not a big purchase like a PS3, but definitely some Pokemon cards, maybe some posters, maybe some books, and who knows what all. He does always manage to find something to spend it on. Cory had band camp this morning. It's a really abbreviated version of band camp - when he first started marching band in 8th grade they had a week of all day band, 10am-5pm, and then a second week from 10am-2pm. They took a day off and went to Noah's Ark at the end of the first week and had a pizza party or something fun the 2nd week, but there was also a lot of playing and marching practice. This year it's more of a get to know the new band teacher, see what the coming year is going to look like kind of band camp, and it only lasts 2 days, 9am-noon. This is the 2nd year in a row they are starting out with a new band teacher. Hopefully this one can stick around for a while, though since Cory is going to graduate, it won't really affect him. It would be nice to get a little continuity and support in the band program, though. We had a get together cook-out this evening for all the band students and their parents, both middle school and high school, so everyone could meet the new teacher and to let the parents know how important their involvement is. It sounds like we will get at least a few more involved with the Band Boosters and helping out, so that's great. The new teacher seems really nice. It's her first full-time teaching job, and she's full of enthusiasm and ideas and hopefully will be really good for our band. So the phone rings at 4:19 this morning. It's Beth. All she says is, "I need Dad." I'm asking, "Where are you? What's wrong?" Turns out she was right outside. She wouldn't tell me what was wrong, just that she needed her dad - "Tell him to run. I need him now!" OK, he's coming but he needs to put some shorts on first. About then we heard Tim's car roar away, Jeffrey got to the front door, and Beth is all hysterical. Tim's drunk, she tried to take his keys so he couldn't drive away, but he grabbed them and took off. I'm not really sure what happened after that because Jeffrey came back and got dressed, grabbed his wallet and keys and was going to go look for Tim or something, but in the meantime Tim came back. They took his keys and made him sleep in the basement, and he was not happy. What I'm not happy about is that Beth didn't bother to call first - before she got in the car and let him drive her home drunk. Her dad has told her repeatedly that she can call and he will come get her, but NO, she climbed in the car with the drunk idiot and then called once he actually got her home safely, because she didn't want him to drive any more. Why even bother to call then? My first reaction was that he got her home safely, why should I even care about him? Why? Except, of course that he could hurt someone else on the way home. So, of course, it was the right thing to stop him from driving - though seriously, why bring him into the house? Take his keys, give him a blanket, and let him sleep in the car. I guess I just don't feel the need to be nice to some idiot who supposedly loves my daughter but shows such complete disregard for her safety. Honestly, I think this kid is bound and determined to ruin his life, and if Beth doesn't watch it he's going to drag her down with him. Does she really want to live like this? Is that boy ever going to grow up? People who sign in for memes, but when I visit their blog I can't find a post for that meme. People who want to advertise on my Entrecard, but haven't actually visited my blog and dropped their card. and the inappropriate use of apostrophes. Ok, I'm done - for now. Jeffrey and Cory have been building a deck this summer. Last Sunday they got the framework for the pergola built. Now all it needs is the boards on top, which we still have to buy. Check out the photos if you’re interested in seeing the deck as it was built. Last night after dinner, grilled steaks and corn which we enjoyed on the deck, Beth put Tillie up on the pergola framework, and she explored the whole thing.